Our team appreciates the time and the means you devote to our game, so we created the program “Loyal customers”. The idea is to give our regular customers different bonuses and show our gratitude. The program contains 4 different levels and every player is part of one of the levels, depending on the amount of Diamonds bought within a 30-days period. 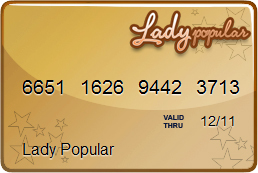 When a player reaches the amount of Diamonds needed for one of the levels within 30 days, they receive the respective Credit card and overdraft. Every Credit card has an expiry date which is 30 days. 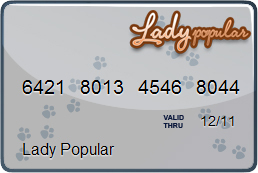 If a player has a Credit card and purchases amount of Diamonds needed for the next level within the due date of the Credit card, they will receive the respective Credit card for the next level. If the player does not purchase any Diamonds or the purchased Diamonds are below the required for the current level within the 30-days period, the Credit card is taken and the respective Credit card is given. Example: On 01.01.2011 a player purchases 1700 Diamonds and receives a Silver Credit card (it needs 1500 Diamonds). In the next 3 days the player purchases an additional total of 2000 Diamonds and the total amount of Diamonds purchased within the last 30 days becomes 3700 (1700 + 2000), so the player’s Silver Credit card is replaced by a Golden Credit card. After that the player purchases a total of 600 Diamonds for the next 30 days. In this case their Golden Credit card will be taken away and they will not be given any Credit card because they haven’t fulfilled the requirements for any of the Credit cards. 4th level: 5000 + Diamonds bought. 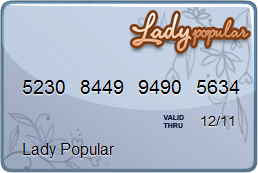 For 4th level: Platinum Credit card. When defining the player’s level in the program the Diamonds received by recruiting other players (10%) are also counted. The Credit card gives you the opportunity to use an overdraft and discount at the Mall. Platinum Credit card: 10 000$. Discount at the Mall – discount of the price of all items in the Mall and the Furniture shop no matter if they are purchased with dollars or diamonds. You can see how many Diamonds you have already bought for the last 30 days and how much more you should buy to receive a higher level Credit card.